Dry Eye Autoimmune Disease Issues? Try TheraLife Starter Kit! Dry Eye Autoimmune Disease Issues? Try TheraLife Starter Kit! TheraLife® especially recommends this starter kit to dry eye sufferers with autoimmune conditions because it includes all of the elements that are essential for getting lasting dry eye relief, collected for you into one conveniently packaged solution. Dry Eye Autoimmune Disease Issues? Whether you suffer from chronic autoimmune dry eyes, blepharitis, or meibomian gland dysfunction (MGD), the TheraLife® All-in-One Autoimmune Starter Kit can help you get relief. These products help reduce irritation and inflammation of the tear glands, eye surfaces, and eyelids. When used all together, they offer a powerful solution. 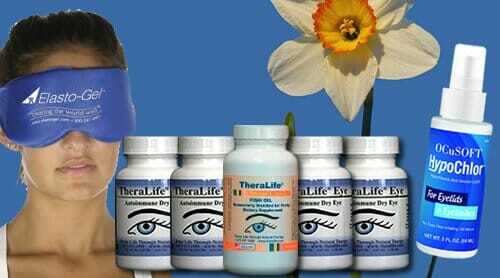 TheraLife® Eye Autoimmune provides sustainable and lasting relief for dry eyes, dry mouth, joint pain, and fatigue from Sjogren’s Syndrome, Rheumatoid Arthritis, Graves’ Disease, and many other autoimmune dry eye conditions. This formula restores normal cell functions to tear secretion glands and salivary glands, and it regulates the immune system to reduce flare-ups. Our dry eye autoimmune disease formula is fortified with: immuno-modulators to help modulate and normalize the immune system; anti-inflammatory agents to reduce irritation and inflammation of the eye, salivary glands, eyelids, and joints; and anti-fatigue agents to improve oxygen delivery and boost energy. TheraLife® Eye Autoimmune comes in (oral) tablet form, and the starting dose is typically 8 tablets per day. Click here for more TheraLife® Eye Autoimmune dosage instructions. Each tablet contains beta-carotene, vitamin E, ascorbic acid, riboflavin, zinc, copper, selenium, astralagus, l-carnatine, and a proprietary herbal blend. All TheraLife® ingredients are FDA approved and tested to ensure safety, purity and the highest biological activity. TheraLife® capsules are manufactured following GMP quality guidelines in pharmaceutical grade facilities in the United States. TheraLife® Inc. offers a 90-day money back guarantee on all products. The TheraLife® management team and scientific advisors represent the best of the best from the pharmaceutical, biopharmaceutical, alternative medicine and medical technology fields. The company has been granted three U.S. patents and has five additional patents pending. TheraLife® Omega-3 Fish Oil uses only the purest fish oils that have been molecularly distilled and 3rd party tested. This ensures toxins and contaminants such as mercury, lead and PCB’s meet or come under acceptable limits set by the Council for Responsible Nutrition (CRN) and other regulatory agencies.The fatty acids found in Omega-3 Fish Oils help to thicken your natural tears and prevent excessive tear evaporation. Fish oil is known for being rich in unsaturated fatty acids. These fatty acids are known to benefit the eye and may assist in the prevention of macular degeneration, cataract and dry eye. Fish oils, also called omega-3 fatty acids, contain components called docosahexaenoic acid (DHA) and eicosapentaenoic acid (EPA). These acids are naturally found in the retina of the eye and are vital nutrients that maintain healthy function of the retina. As we get older, our bodies may produce less DHA & EPA and the only the way the body can take in these vital essential fatty acids is through proper nutrition and supplementation. Like all TheraLife® products, the Omega-3 Fish Oil comes with a 90-day money back guarantee. Our Eye Lid Cleanser is a gentle, refreshing, soothing product for everyday eyelid and eyelash cleansing. It offers powerful control for serious conditions such as Blepharitis, Meibomian Gland Dysfunction, Meibomitis, Demodex, and Chronic Dry Eye Syndrome. Daily use can also help prevent these serious conditions from developing. Our Eye Lid Cleanser works by keeping your lids and lashes clean and free from debris and a wide range of microorganisms. This natural formula contains pure hypochlorous acid (HOCl), which is naturally produced and released by neutrophil cells, part of the body’s natural defense mechanism against pathogens. This product contains no buffers, preservatives, or surfactants. Every bottle contains 40ml. 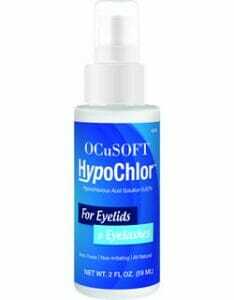 Use daily for optimum relief from dry eye autoimmune disease issues. A Hot Compress for your eyes provides relief from chronic dry eye autoimmune disease pain. Use it from time to time during the day and/or for night time dry eyes to keep your eye lids closed during sleep. The hot compress for eyes is made of Elastogel for lasting heat retention and easy cleaning.